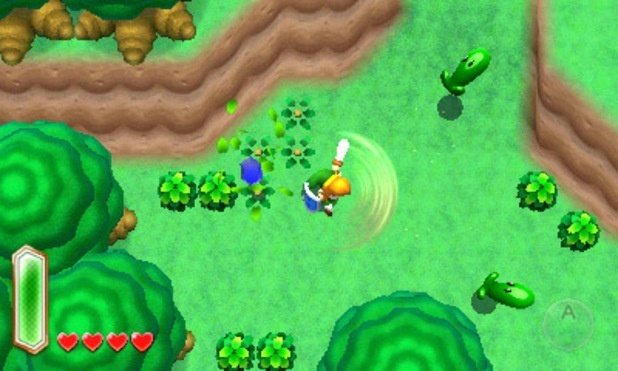 The Legend of Zelda: A Link Between Worlds, the upcoming 3DS title set in the same world a A Link to the Past, has been listed for a November release in North America. The date was announced during an analyst meeting at E3, where Satoru Iwata revealed the schedule of 3DS titles Nintendo has in store for 2013. Europe is still down for "toward the end of this year" but it shouldn't be too far away from the same date as North America. The name for the game was officially unveiled at E3 and it seems November will be the month we get our 3DS Zelda fix. Will you be getting this in November, North America? Let us know by leaving a comment below. Europe better not get this game in October or something. I would rage so hard. This won't be released in October in Europe alongside the Windwaker- Nintendo wouldn't release 2 Zelda games in the same month. Not sure how I feel about this title. I might buy it...... still not sure. I might pick this game up sometime if I find it for less than 30 euros. I played through Link to the Past last year first time in ages and, even though I don't care for Zelda series, I actually found it better than I remembered, It's nothing special but I had a fun enough time. The 11 on that investor presentation image is for the calendar month (November) not the date. The game has no date as of right now. Plus the 11th is a Monday, which would be odd for releasing a game. Well that's troubling news for Europe. Given the delays of retail releases from NA to EU though I'm guessing we'll end up getting it at least a half month later. The trailer sold me. Sure I'll consider it. @RestlessPoon Yes, because it's not like Europe typically has to wait 6+ months for games. I now know what I'll be doing November 11th. Hopefully I will get the oracle games done by then. Another day-one buy for me. I'll likely be finishing Wind Waker HD by then. Still iffy on the name. Feels a bit clunky. But Nintendo knows my wallet is ready! Well I just hope its released before December if they want to get as much sales as possible. I will get this, but not gonna be too excited. I prefer 3D Zelda games. Nice, I wasn't expecting any earlier than December, but I guess they probably want it out for Black Friday. Why is it always said that we get our "_____ fix"? As if we were broken without that particular game. A Link to the Past is my favorite Zelda so hell, yeah, I'm getting this day one. God I love the 3DS! Even with some delays there still so many great titles to look foward to this year! I hope this will be a retail release. The visuals lack the charm of ALTTP and seem a little too bland and basic, i guess that's what happens when you opt for 60 frames per second on the 3DS. You get less graphical detail and how much you can have on screen. Still, I'd rather it be 60fps than 30! @KnightRider666 I'm sure it will be. Just as long as we get it before Christmas in Europe, I'll be happy. @RestlessPoon right, but we have to just take it when NA gets games like Fire Emblem: Awakening over 2 months before Europe. I'd hazard my guess that Europe will get the game around the same time anyway. NoE have been on the ball with release dates for Nintendo games recently and we've seen most games launching within just a few days of each other. Fire Emblem was the exception, probably because of the additional censorship requiring a couple more months of red tape. It looks like Minish Cap Link is in this game. What's different about this game, though? So far it looks like an exact copy of A Link to the Past with new abilities. Anyways, Oracle of Ages/Seasons already downloaded for $5 apiece. Go and get yourself some! As much as I LOVE Zelda games, I have not played through A Link To The Past yet and with lots of other Nintendo games coming out this season as well as the Xbox One I'm getting, I'll have to pass on this one for now. YAY! In time for Christmas! Definitely asking for it. I'll buy it on day 1. Just before my birthday perfect time for it to come out.